I love eggs for breakfast, but Mangy is a little strange. Some days he’ll order poached eggs and thoroughly enjoy them for breakfast. Other days he’ll refuse to eat them, claiming that they’re too eggy. How can eggs not be eggy?? I I try to be open minded about his quirks, but sometimes I wonder about his food habits….just a little too weird for my taste. With Mangy away this week I decided to treat myself to a nice Sunday breakfast. Egg Soufflé on the menu this morning. This is a really quick recipe to feed just one or a crowd. Very tasty and a great way to use up leftovers. 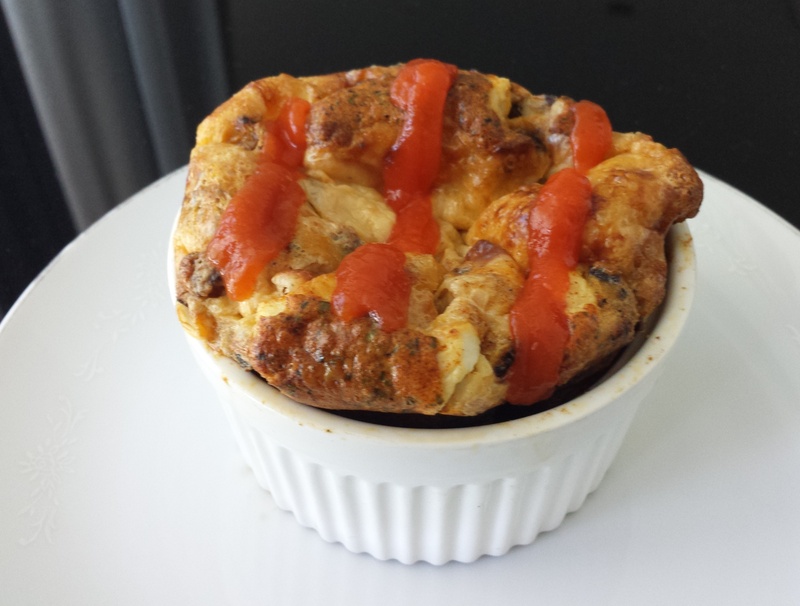 I had my egg soufflé with hot sauce, but I imagine it would go beautifully with some fresh salsa. Heat butter and oil in a pan. Add vegetables, garlic and vegetables and fry until soft. Beat eggs, milk, smoked paprika, garlic powder, salt and pepper. Grease a ramekin and set on a tray. Place vegetables in the bottom of the ramekin, add cheese and then pour egg mix on top. Bake in the oven for about 25 minutes. Serve hot. Enjoy!